I’ve seen some very thoughtful gift guides around the blogosphere over the last few weeks, so I thought I’d attempt to create one, too. I know we’re getting down to the wire for online holiday shopping at this point, but here are some healthy, fair-trade and green gift ideas. 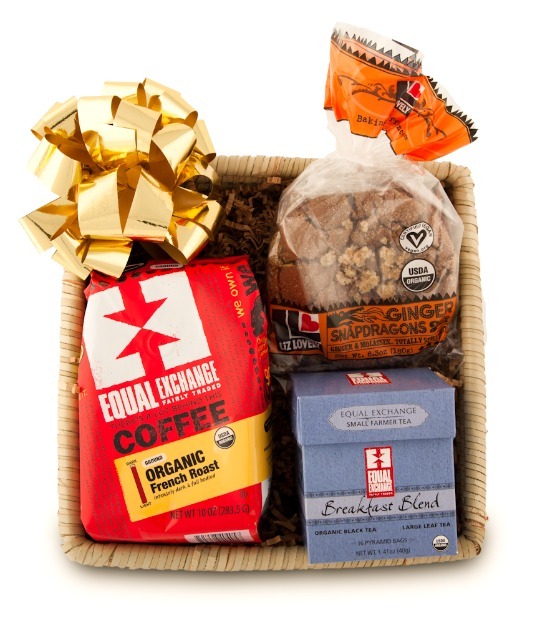 Equal Exchange makes a great selection of holiday gifts that are fair trade and assembled by hand. I was lucky enough to sample this “Good Morning Basket” courtesy of Equal Exchange recently and I was impressed by how delicious the tea and vegan cookies were. I’m not a huge coffee drinker, but look forward to enjoying the organic coffee, as well. Each gift ships in its own gift box with recycled packaging and filler. Gifts can be ordered online or by phone if you prefer, and custom gift cards with your personal message are included with each order. Fair Indigo offers products that are organic, eco-friendly, fair-trade and made in the USA. I just love these texting gloves. Global Girlfriend’s products are all made by woman, fair-trade, and eco-friendly. I have the bracelet versions of this “PEACE” necklace, which I love, and I think this scarf is beautiful. I also put a few items in my Open Sky shop that I think would make great gifts. I chose this whipped shea lemon body butter, these organic facial products, this chocolate body gift set, this eco-friendly laundry kit, this salt/sweet/spice package, this truffle honey, this fitness travel kit, and this green gourmet holiday gift basket. I think this recycled cotton throw and this pendant are really lovely, as well. What great ideas! Definitely love the Good Morning Basket! Thank you for this lovely gift guide! I so admire your taste (and your values) so I know that I will enjoy perusing these different sites. Thank you so much for sharing this with me! I hope you have a lovely week!